The Kashmir valley experienced a painful, ultimately unsuccessful armed movement for self-determination against Indian rule from 1988-2002. While a ceasefire was declared in 2002, Kashmir’s political future continues to be mired in uncertainty, caught between the national interests of Pakistan and India. Despite the end of the armed struggle, the vast majority of Kashmiris aspire to the yet-unfulfilled promise of self-determination (azaadi). The Indian state responded to the movement for self-determination not as an indigenous struggle, but rather as cross-border terrorism.1 As such, continued militarization of Kashmir, initiated in response to the threat of terrorism, has been justified on the grounds of protecting the Indian nation-state’s territorial integrity. Multiple temporalities characterize the militarized everyday life in Kashmir, and they are deeply shaped by experiences of doing fieldwork in Kashmir. I think through multiple, rather different kinds of public “events” to understand how militarization is conceptualized and temporalized. One such catastrophic event occurred this past February. On a Saturday morning, Kashmiris awoke to the news that Afzal Guru, a 43-year old Kashmiri man convicted of “aiding and abetting” an armed attack on the Indian parliament in December 2001, was secretly executed in a jail in Delhi. Guru had spent the last twelve years in solitary confinement, in the company of Sartre and other French existentialists. In 2005, an Indian Supreme Court judgment gave Guru three life sentences and a double death sentence, arguing that although there was only circumstantial evidence against him, “the collective conscience of the society will only be satisfied if…capital punishment is awarded to the offender” (Appeal 373-375 of 2004). Despite serious doubts cast on the veracity of the case built against Guru by legal experts and commentators, Guru’s execution went ahead. While Indian TV channels and newspapers accompanied the news story with a lurid graphic of a noose around Guru’s neck, Kashmiri protesters held up photos of Guru looking peaceful and pensive, with a kaffiya wrapped around his head. The images below exemplify the existence of two Afzals, materialized through their different physical appearances. Guru himself may not have been surprised by this bifurcation. In a 2006 interview, in response to a question about how he would want to be remembered, he answered, “As Afzal, as Mohammad Afzal. I am Afzal for Kashmiris, and I am Afzal for Indians as well, but the two groups have an entirely conflicting perception of my being.” For Kashmiris, Guru’s death made explicit the alienation between India and Kashmir in an intimate, profoundly personal way, since the Indian state refused to return Guru’s body to his family. As Kashmiri writer Mirza Waheed put it, the decision to bury Afzal Guru in Tihar jail exemplified how even a “Kashmiri corpse can be seditious.” Yet, perhaps unsurprisingly, Guru’s death did not signal the end of his life, but rather, the Indian state’s refusal to return his body forced new forms of political action. 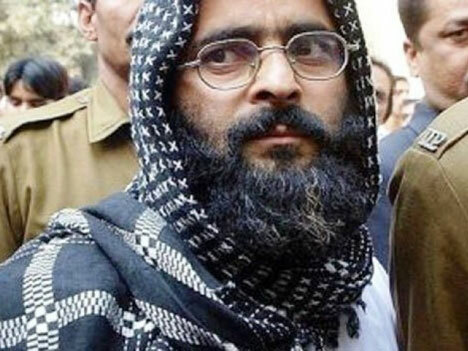 The image of Afzal Guru widely circulated in Kashmiri newspapers and blogs. After the news of Guru’s hanging, mass protests broke out in Kashmir. In response, the Indian military imposed curfew for days. Local newspapers and cable TV networks were blocked, and 185 out of 252 ATMs in the valley were put out of commission. Despite the restrictions on movement (curfew in Kashmir implies restriction on movement as well as time), a group of Kashmiris erected a tombstone for Guru over an empty grave in Mazar-e-Shuhada, the main Martyr’s Graveyard. The Urdu epitaph reads, “The martyr of the nation, Mohammad Afzal Guru…whose mortal remains are lying in the custody of the Government of India. The nation awaits its return.” Meanwhile, most Indians digested the event as a triumph of justice. I tried, but was unable to read, many of the comments on major Indian news sites; their celebratory, high-pitched tone was unbearable, even though I was living across the world and outside the crisis-time. Some weeks later, a seemingly different news story from Kashmir caught my attention. This time, media outlets reported that counterfeit versions of the antibiotic Amoxicillin Trihydrate were supplied en masse to several hospitals in the capital, Srinagar. Laboratory tests of the pills, Maximizen 625 and Curesef, which are supposed to contain 500 mgs of Amoxicillin each, showed no traces of the antibiotic. According to some accounts, over 200,000 pills had been distributed to hospitals in Kashmir the previous year and had possibly contributed to the deaths of hundreds. A number of professional medical organizations and political parties called for a statewide shutdown (bandh) on May 6 to protest the sale of spurious drugs. Syed Ali Shah Geelani, one of Kashmir’s leading political figures, linked the government’s supply of spurious drugs as a “conspiracy [by the Indian government] to carry out genocide” against Kashmiri civilians. Unlike the protests after Guru’s death, however, the protests against the drugs were halfhearted. Newspapers reported that despite calls for a shutdown, only one of Srinagar’s main marketplaces remained closed; the rest of the city functioned “normally.” As the story unfolded, it became about systemic corruption and governmental neglect. Government documents later revealed that the Drug and Food Organization took more than three years to test samples of medicines. Several news articles reported how the scandal tapped into widespread fears surrounding biomedical technologies, particularly pills, in Kashmir. One government employee was quoted, “One trusts nothing in Kashmir these days. If a committee of senior doctors by the government can purchase fake drugs, what stops retail drug shops from selling spurious medicines?” This was something I had experienced first hand while observing interactions between mental health experts and patients. I learned that despite complaints by medical professionals that Kashmiri patients were irrationally desirous of pills, there was intense circumspection and doubt surrounding their consumption. For example, patients often questioned the efficacy of pills based on the fact that although “branded” and “generic” drugs reportedly had the same active ingredients, there was a significant price difference between them. “How can one drug cost 15 rupees and the other drug cost 150 rupees, and they be the same thing?” one of my interlocutors asked rhetorically. In general, if they could afford them, patients preferred foreign pharmaceutical brands over their Indian counterparts. However, doubts over pills were not limited to their material or ontological form. Patients also identified pills as permeable objects, transmitting the nefarious intentions of corrupt medical practitioners. In this sense, Western biomedicine was not viewed as a neutral or universal form of knowledge, but rather was shaped—and corrupted—by its social and economic context, in this case, Kashmir’s endemic corruption brought about by decades of unaccountable governance and counterinsurgency structures. It feels odd to draw a connection between these two events—the event of Afzal Guru’s execution and the report of spurious drugs—because it invariably invites a comparison. Yet in writing about violence, we are forced to choose between such events all the time. It is perhaps worthwhile to ask: what makes an event significant, in the sense that it makes it into public consciousness and calls for ethical reflection or action? Which events are presented as self-evidently significant, and which remain under the surface? On the one hand, Guru’s hanging represents a moment of shared, public mourning, (another) notable rupture in the history of Kashmiri-Indian relations, and one likely to be remembered by Kashmiris for generations to come. On the other hand, while there were considerable efforts to mark the report of spurious drugs as a kind of public health “crisis,” this moment produced an active response only from health professionals. Part of what made Guru’s death visible and urgent was that his death localized the cumulative suffering of Kashmiris in a singular body—and in a specific temporal moment. On the other hand, the knowledge of spurious drugs dispersed suffering across different bodies—old and young, male and female, rich and poor. While Guru’s death provided specific knowledge about Kashmir’s suffering, the effect of the bogus pills was diffuse and general. These two moments also reveal something about the limits of our own heuristics of “catastrophic” vs. “mundane” violence, categories that are not entirely satisfying for Kashmiris either. While Kashmiris, like scholars, struggle to make space for everyday suffering in a context where spectacular forms of injustice are plenty, the fact is that both events cohere within a single framework. Many Kashmiris told me that the conflict is a disease (bemari). In this sense, while Guru’s death represented an important moment of localization, there were many other everyday moments where Kashmiri patients refused the logic of containment. In the clinic, overwhelmingly, the Kashmiri patients I spoke with refused to specify their suffering or locate them within specific diagnostic categories. Patients who suffered from a range of diseases, from depression to diabetes, all shared a common symptom, that of kamzori or bodily weakness. While other symptoms would often be treatable through the consumption of pills, complaints of weakness did not respond to medication. Similarly, rather than locate their suffering within a specific catastrophic event, patients preferred speaking of their daily struggles of life under occupation: how they worried about the safety of their children when they went to school, how it was impossible to be healthy in Kashmir, and how their quality of life or livelihoods had suffered because of frequent strikes and shutdowns. My questions about how the post-1989 period was different from the pre-conflict days also exceeded the timeframe of militarization I imposed: “This occupation is nothing new,” many said, “We have been colonized for 400 years,” referring to previous colonization of Kashmir by Mughal, Afghan, Sikh, and Hindu rulers. What does it mean to do fieldwork in these intersecting temporalities? In practical terms, it meant navigating security checkpoints, unruly traffic, and gun-wielding soldiers on the streets; accounting for days of unexpected protests, strikes, or curfews, and attending to not one but two simultaneous calendars, the “official” calendar of the Indian state agencies and a “protest” calendar published weekly by a Kashmiri separatist political organization. At the time, I told myself that the first-hand experience of curfew was important to what I was writing and, in a way, encapsulated what Kashmiris had been going through for the past twenty years. In my field journal, I carefully chronicled my feelings of imprisonment—I felt I truly understood the meaning of “cabin fever”—since there were days when I wasn’t allowed to leave the house at all. At the same time, as a non-Kashmiri, I was fully shielded from the dangers and tribulations of the streets. I never felt personally threatened during my time in Srinagar, and in any case, I had the luxury of hopping on a plane to Delhi at any given time. I was not living in a different place, but I was in a different time: fieldwork time, temporary time. These important differences led me to question my ability to truly feel the claustrophobia of occupation in all its myriad glory. Yet my friends and interlocutors consistently used 2010 as a badge of my authenticity: “You were there,” they would say, “so you know.” Even while I was going through the summer of 2010, though, I kept thinking about a future moment of writing: how in the world am I going to write about this? What will it mean to leave that immediacy, the up-to-the-minute updates, behind? As much as “catastrophic” events such as Guru’s death drew me back in to events in Kashmir, there were people and narratives that pulled me away. Over time, I have become more and more interested in events that exist below the surface and seem to be a necessary yet subtle part of how Kashmiris experience and understand suffering in the longue durée. This is the kind of suffering that is beyond intervention; it’s a suffering that transcends this world, as someone told me. It is a suffering that becomes almost invisible, yet still palpable, in a less localized yet equally significant way. It is the suffering of an empty street, a shuttered shop window, a scrawl of graffiti, the sound of a stone hitting an armored truck, and loud, unrestrained laughter in response to its absurdity. 1. Many young Kashmiri men crossed over the border to Pakistan in the late 1980s and early 1990s to receive military training. 2. Povinelli, Beth. 2011. Economies of Abandonment: Social Belonging and Endurance in Late Liberalism. Durham and London: Duke University Press, pp. 13-14. 3. An encounter is a euphemism used in South Asia to describe extrajudicial killings in which the victims are described as suspected gangsters or terrorists. A fake encounter refers to death in custody or cases where unarmed victims are framed. 4. This was not the first time that mass protests had broken out in the post-ceasefire period in Kashmir; there were also major protests during the summers of 2008 and 2009. However, the protests of 2010 and the brutal response led to an unparalleled outpouring of grief, concern, and outrage on the part of Kashmiris, but also many Indian commentators. For the first time, there was the acknowledgement on mainstream Indian channels that something was deeply wrong in the government’s policies on Kashmir. Saiba Varma is a postdoctoral fellow at the Thompson Writing Program at Duke University, where she teaches writing classes on violence and suffering. Her research focuses on Kashmir valley and its psychiatric and psychological humanitarian interventions. Varma also has a PhD in anthropology from Cornell University.